Saudi Women Still Can't Drive, But They Are Making It To Work : Parallels Despite many obstacles, more Saudi Arabian women are joining the country's workforce. NPR's Deborah Amos profiles a successful online advertising agency that's run entirely by women. Saudi women, shown here at a cultural festival near the capital Riyadh on Sunday, still need the permission of male relatives to travel and even receive certain medical procedures, but a growing number are entering the workforce. The sign on the door to the office of eTree, an online advertising agency in Saudi Arabia's capital, Riyadh, reads: "Girls Only." The company's founder, Esra Assery, admits it's a little sexist, and we both laugh at the joke in male-dominated Saudi Arabia — the only country that prohibits women from driving a car. Getting a job isn't easy either, with the country's conservative traditions and gender segregation, but Saudi women are entering the workforce in larger numbers than ever before. Nowhere is that more striking than at companies like eTree, which Assery, 30, founded in 2011. The open workspace looks a lot like a college dorm: desk clutter, potted plants, family pictures and a snack table with chips and chocolate. Assery says she recruits women exclusively because they are more motivated than Saudi men. In this deeply conservative country, a woman needs permission from a male guardian to travel, for education, even for some medical procedures. But when it comes to business, men and women are equal under the law, Assery says. 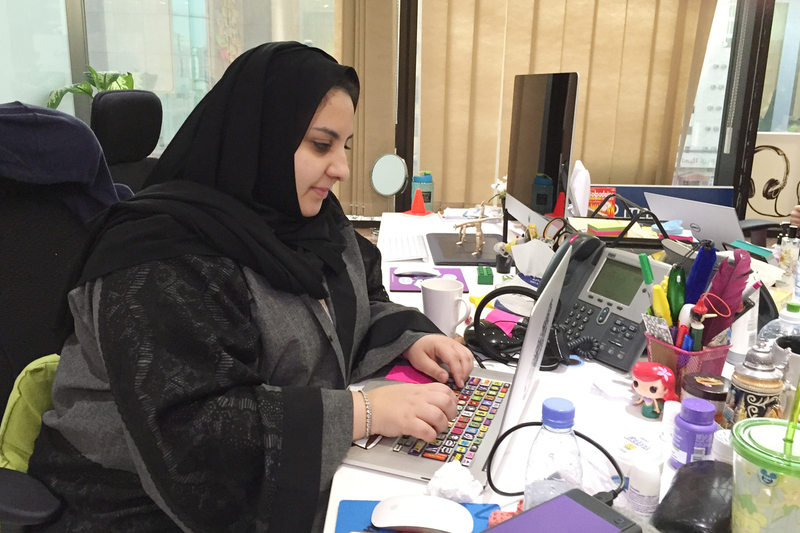 Esra Assery, 30, founded eTree, an online advertising agency in Riyadh, in 2011. The all-female company has a staff of more than 30 and Assery has plans to expand. 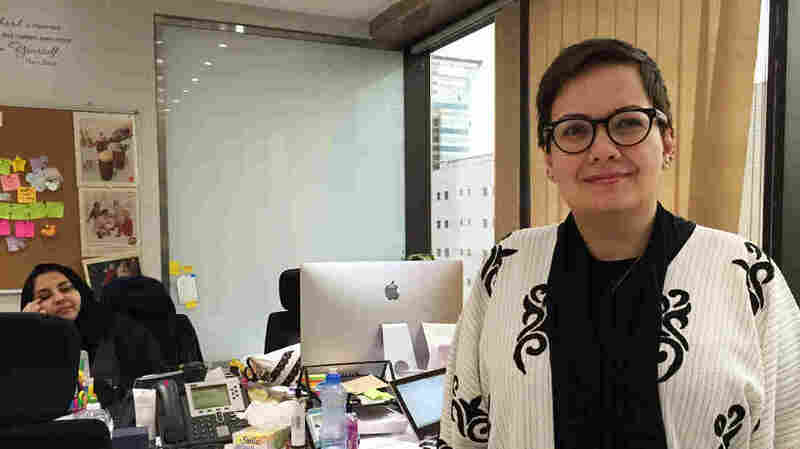 Saudi women must be fully covered in public, but in an all-female office, they are not required to have a headscarf or an abaya, the robe-like dress. She has built a $15-million business based on understanding social media, which is huge here — 8 million Facebook users, 3 million on Twitter — and growing fast. "[Twitter] is where people discuss their thoughts, people spend time hanging out. It gives you an indication of the trends that are happening," Assery says. "Everything that is happening in Saudi is there on Twitter." Her clients want to reach that social media audience. They want to build their brands online, and that's the business Assery has tapped into. "I wanted to do it because no one else was doing it. There was a huge demand in the market for that," she says. "And then, of course, to start and create jobs for locals. It's 100 percent Saudi, 100 percent run by Saudi females. So, it's a commitment to create jobs for Saudi females." It's a commitment the government backs. The policy is called Saudization, and it aims to replace the huge number of foreign workers. The government has set quotas, and private businesses are required to hire more Saudis. Still, unemployment among Saudi women is five times higher than for men. That makes eTree unique — the first Internet startup company with an all-female staff. Jihad al-Ammar, an investment manager, advises Mobily, a large telecom company, on startups. He has worked with Assery and her eTree staff. "They definitely seem to have their own vibe, their own voice, and they are excellent," he says. Rasha Abu Samra works in the office of eTree, an online advertising firm. Women outpace men when it comes to advanced degrees in Saudi Arabia, but the rate of unemployment among women is much higher than for men. That excellence may have something to do with another startling statistic: Saudi women are the majority of college graduates, and they hold more advanced degrees than men. But there are still limited opportunities for women. Internet startups alone won't fill the gap, Ammar says. That doesn't stop the all-female team at eTree, which is moving to a bigger office soon. Assery says she will hire more women and add to the three dozen already on staff. She has installed a massage chair in the office to reduce the work stress. Companies like eTree are one sign that the workplace is expanding for women. A newspaper headline this week is another: Some women are forced to share their earnings with their husband. The issue is now part of the national conversation. In this traditional society, men manage all the household expenses. But now, Saudi women say a working wife should be able to spend what she earns.